Preliminary design plan for a large scout cruiser, prepared to support General Board discussions concerning the characteristics sought in future cruisers. 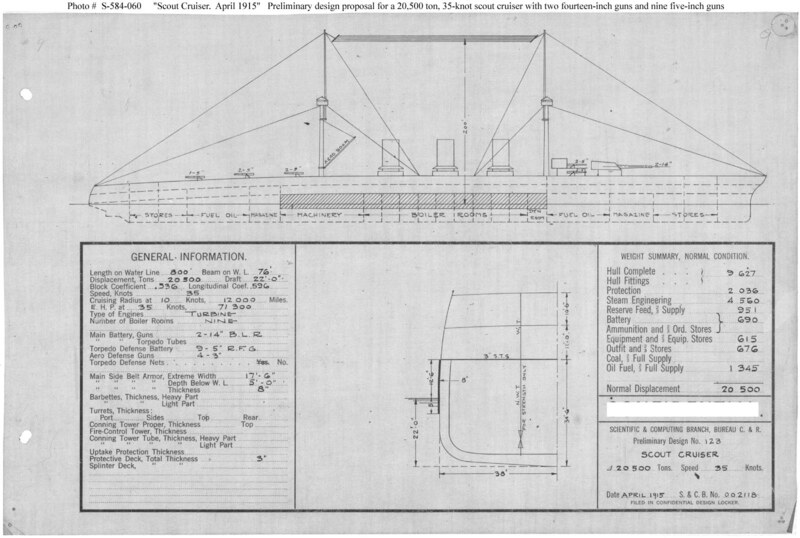 This plan provided two 14-inch guns and nine 5-inch guns and a speed of 35 knots in a ship 800 feet long on the load water line, 76 feet in beam, with a normal displacement of 20,500 tons. This design included 2,036 tons of armor, 8-inch side armor over 322 feet by 17 feet 6 inches amidships plus 3-inch deck protection, adding 10,000 tons displacement over design No.112. This design was eighth in a set of 11 undertaken as a group during 21 to 29 April 1915 to explore tradeoffs among armament, protection, and size in large scout cruisers capable of 35 knots speed. This design series took Preliminary Design No.112 (see Photo # S-584-050) as a baseline. Ultimately, however, no ships of this type were built.